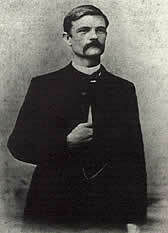 Samuel Porter Jones (1847-1906), an American Methodist Evangelist was born in Alabama and reared in Cartersville, Georgia. Jones was a lawyer but was a drunkard. He trusted Jesus Christ as Lord and Saviour, being stirred by his father's dying words. His life was dramatically changed, preaching his first sermon one week following his conversion. He went on to live a full and sober life, becoming one of the preeminent evangelists at the turn of the century. He was known for his crude wit, coarse stories, and opposition to the liquor traffic. Thousands were saved and cleansed as a result of his ministry. The Psalms are an interesting study for any man. I like to read Dickens and Thackeray and Bulwer and Shakespeare, because they evince such a deep insight into human nature. A man may study the pages of such books as these to advantage, but there is more for me in these one hundred and fifty psalms than in the writings of all these masters. The authors I have named give me human nature as we might see it if we were standing on the streets or in your stores. But David gives us human nature as it is acted upon or influenced by the Divine Spirit. I never have much to say against human nature. I have very little abuse for a man in his normal state. It is perverted human nature I fight. It is the perversion of hand and foot and tongue and mind that I am ready always and forever to denounce. David gives me human nature as it is acted upon and influenced in the best way. I love to read David, because, in the first place, David knew what he was talking about. I love to hear a man talk who seems to know what he is talking about. I've heard men trying to explain a great many things they didn't understand. I love to read David, because he experienced what he was talking about. No man before him knew more of God and more of humanity than David, and the best preacher that ever planted his foot in this city is the preacher who knows the most about God and the most about humanity. He stands between the two, and hence he ought to know God, and lay his hands on the shoulder of his living Father in heaven, and then put the other arm around the race, and try to lift humanity up to God. This David could do. Now this man who had studied life in all its phases, a man who seemed to understand God as no man before him and very few after him, a man who seemed to understand himself and understand human nature - gives us the conclusion he had reached in these words, "Blessed is the man that walketh not in the counsel of the ungodly," as much as if to say, "If you want to be a happy man" - and all men want to be happy - "If you really are in search of happiness, listen to this prescription: 'Blessed and happy you will be, if you walk not in the counsel of the ungodly.'" An ungodly man may be a very moral man; an ungodly man need not swear, nor drink, nor violate the Sabbath, nor commit any of the flagrant sins which men are so often guilty of. An ungodly man means simply an ungodlike man. Ungodliness and ungodlikeness are synonymous - they mean the same thing. What does ungodly mean? It signifies not acquainted with God, and God's ways. Every man who knows God, loves God, and every man who does not know God, doesn't love him. It is just as natural for a soul that knows God to love God, as it is for a mother to love her babe, or as it is for a father to love his son. An ungodly man is a man who cares nothing about God. I'll tell you the distinguishing characteristic of that sort of men. They love to talk. They scoff at the idea that anybody ever died for them, but they are all right, and they can give more advice, and practice less of it than any tribe in creation. The way to tell an ungodly man is that he is always talking about what harm is there in this, that, or the other thing, and the way to tell a godly man is, he is always hunting around for something with good in it, and not going about trying to find something that people can see no harm in, as they say. If there is no harm in cards, why I haven't the time to play cards, and I'm sorry for the man and woman that have time to dance. I tell you, brethren, when I look around me and see a sinking world and humanity drifting off from God, and so many sick beds to visit, and so many that are poor and need sympathy and help, I have no time to spare for these things; and you wouldn't have either if you were of any account. You can put that down! "Blessed is the man that walketh not in the counsel of the ungodly." In other words, if you want to be happy in this life, don't take counsel or advice from ungodly men. Don't do that! When you are lost as to any moral problem, go to the best man or the best woman you know in the world for good advice, for they're the only ones capable of advising you. I want a man first to practice what he preaches, and show me it is good to do it, and then tell me how he did it, and then I want to do just like him. An ungodly man! As I said before, you can hardly pick a flaw in him; he never goes far enough to be dubbed immoral. What's the difference between an immoral sinner and a moral sinner? Why, it's just the difference between the typhoid fever and the smallpox. That's the only difference at all. One's internal and the other is external, but both will kill nine times in ten. An ungodly man "Can't see any harm in anything." He is like an old Irishman down in our town, who was a devout member of his Church. He was very profane, and a man said to him one day, "Jack, how can you be called a devout member of your Church and swear and curse as you do?" And Jack replied, "Faith, sir, and there's no harm in cursing unless you make harm out of it." Do you get the idea, brethren? I am not hunting those things that have no harm in them, but I'm hunting the things that have good in them, and so are all good men under all circumstances. They ain't inquiring whether there is much or little harm in this, that, and the other thing. If you want to be happy, brethren, don't take the advice or counsel of the ungodly, or of those men who run on that line of things. They'll get you into trouble sooner or later, sure. Take the question of theater-going, and nine-tenths of these ungodly people in the Church and out, you'll find go to the theaters. Let's raise that question a little while here. A preacher in St. Louis told me that during his pastorate in Chicago there was a young lady, teacher in one of the schools, who came to him during a revival. Her conscience was stirred, and she walked up to him and said, "I want to be a Christian. I want to join your Church, but you object to theater-going, and I can't see any harm in that at all." The pastor said to her, "Sister, give your heart to God, join the Church, and go to the theater as much as you please." She joined the Church, and after that went to the theater. Next Summer the revival started again, and the young lady came into the church, and took a class in the Sunday-school, and tried to live right. One day during the revival one of the young lady's pupils, who had become penitent, came to her and said, "Miss So-and-so, do you go to the theater? And she answered, "Yes; I go occasionally." The pupil then asked, "Do you think it is right as a Christian to go to the theater?" "Well," said the teacher, "I don't know." And the pupil asked again, "Miss So-and-so, if you go as a Christian, can I go as a penitent?" And the young lady told her pastor, "I looked that sweet girl in the face, and said, 'Darling, I'll never put my foot inside another theater, God helping me, as long as I live.' My liberty as a Christian was costing that girl her soul, and I said to myself, 'My liberty shall never do that,' and I gave up the thing that was leading a soul from God." That's the way a Christian will settle that question every time. My liberty and license in these things shall never cost a human being his soul. Lord cure us of this abominable way of asking, "What harm is there in this?" But nobody has ever asked me, "Is there any harm in family prayer?" They never asked me if I thought there was in harm in reading the Bible! Do you want to know why? Because they knew there was no harm in it! Why did they ask me the other question? Because they knew there was harm in it, and that settles the whole question. "Blessed is the man that walketh not in the counsel of the ungodly." When a man gets to listening to bad advice the next thing he's going to do is to stand in the way of sinners. That means, keeping the company of sinners; and a man isn't going to listen to bad advice long before he'll be with sinners. I don't care whose boy, or wife, or child you are, you can not stand the pressure of bad company. We need to inform ourselves in this question of company. There isn't an angel in heaven that can keep company some of you do and be pure. Above everything in the universe, a man ought to be choice about his company and about his books. If you will show me the company you keep, I will write your biography ten years ahead of your death, and I will not miss the mark one time in ten. "Birds of a feather flock together." I will tell you another thing. There is but one safe rule in this line. Don't you ever go with anybody that will say things you won't, that will do things you won't do. You won't run with them long until you will be doing those things and saying those things yourself. Always hunt better company than you are, for when some of us get up to ourselves, we are with the biggest rascal in town right then. And that gets things in a bad shape, doesn't it? I am sorry for a fellow when, every time he goes off by himself, he is in the worst company he was ever in in his life. I will illustrate that for you. There was a very stingy man I once heard of down in our country. His wife was a Methodist, and he would go with his wife to Church, but he never would pay a dime toward the support of the Church. One summer he professed religion and joined the Church himself. Well, shortly after he joined the Church, the stewards went over to his house and spoke to him kindly and told him: "Our preacher is now in need of provisions, and I came over to see if I could get some meat from you for him." He had a smoke-house full, and he thought a minute: "Why," said he, "certainly, I will give the preacher some meat." He went out to his smoke-house while the steward sat at the window. He walked up to the smoke-house, unlocked the door, took down a big, fine ham, brought it about half-way to the house, stopped and laid it down. He looked at it a while, and turned around and walked back to the smoke-house, got another and came and laid it down also. Then he stood and looked at it for a minute, turned back to the smoke-house and brought another. The steward was watching him, and he looked down at the three hams. He heard him say: "If you don't shut your mouth, you old stingy devil, I will go and give him all the meat there is in the smoke-house." The devil was in him, and told him every time: "Are you going to give away that ham?" And the devil kept after him, and he tried to hush his mouth by putting down one ham at a time, but finally he silenced him when he said, "If you don't hush your mouth I will give him every ham in the smoke-house." And then the devil hushed. So a man can be in bad company when he is by himself. "Bad company will ruin you." Above all things we ought to be careful about the associations of our children. If that neighbor of yours is worth fifty, or seventy-five, or a hundred thousand dollars, he may have the worst children in town, and yet you will let those children of his come over there and ruin yours because he has got a little money. Did you ever notice that streak of human nature? If that neighbor's son of yours drives a fine horse and buggy in the streets of this city and belongs to one of the fashionable clubs, that is all I want to know about him or any other man. It is only a question of time when he will be drowned in debauchery and ruin if he is a member of a city club. I don't care if you are as pious as Job, if you will join one of those clubs and begin to run with them, I would swap your chances of heaven for those of Judas Iscariot. I am determined to be understood, you see, and you all can disagree with me if you want to; but you shan't run away from here and say: "I declare, I didn't understand that fellow." You shan't say that. I want to make you see what I am talking about. "Nor standeth in the way of sinners." O, mothers, look to the company of your children. Fathers, look to the company of your sons. And I say to you tonight, whenever it becomes a known fact that my daughters keep company with dissipated young men and my sons have gone out into bad company, I shall lose all hope for the future of my children. O, stand by your children and protect them. Boys, listen to me. You never can get higher than the company you keep. If you would be noble and true, seek the best atmosphere of earth, and live in it forever. Stand not in the way of sinners. In this verse, David adds, "Nor sitteth in the seat of the scornful." Now, brethren, we notice first he is walking along, in the counsel of the ungodly. Well, when a man is walking in this way, he can turn to the right or turn to the left by the movements of one set of muscles; but you let him stand right still and he has got to move every muscle in his body to get off; and then let him sit down, and nine times in ten he is there to stay. While walking along in your youthful days, God's minister used to come and impress you and move you and turn you, but by and by you got to standing, and then the thunders of worlds could not shake you or turn you. Some of you have reached the last stage, the ante-room to hell, and that is sitting in the seat of the scornful. God pity a poor wretch that has gone through bad counsel into bad company until finally he is sitting down in the seat of the scornful, where he can laugh at the preacher and make fun of God and scorn the Bible. "Nor sitteth in the seat of the scornful." A man never gets over the fact that he has taken such an attitude toward God. "But his delight is in the law of the Lord." I tell you, brother, when you get to where you will like this Book, and read this Book, you are laying a foundation then. Young boys, take this Book; let your delight be in the counsel, in the law of the Lord. I never think of what this Bible is to a man but I think of a little boy. He was the good boy in the town, and all the boys recognized him as a good, upright boy. And they laid their traps to get him drunk. They sent one of the shrewdest of the bad boys to him, and he met him on the street, and he said, "Johnny, come into the grocery and let us have a mint julep." Johnny say, "O, no, I can't go in there." "Well, why?" "Well, my Book says, 'Look not upon the wine when it is red,' much less drink it." "O, he says, "I know the Book says that, but come in and take one drink." "Well," he says, "I can't do it." "Well, why?" "Because my Book says, 'At the last it biteth like a serpent and stingeth like an adder.'" "O," he says, "I know the Bible says that, but come in and take one drink." "No," he says, "my Bible says, 'When sinners entice thee, consent thou not.'" And the bad boy turned off and left him, and went over to his companions, and they said, "Did you see him?" "Yes." "Did you get him to drink?" "No, I couldn't get him in the grocery." "Well, why?" He said, "That boy was just as chuck full of Bible as he could be, and I couldn't do a thing with him." Ah, brother, "his delight is in the law of the Lord." Now, let me give you the germ of happiness that may spring up and be a tree under which you can sit in its shade and eat its fruits. Listen: these texts, these two verses, furnish the secret of a happy life. I beg you, don't walk in the counsel of the ungodly! Don't stand in the way of sinners! Don't sit in the seat of the scornful, but take the Book of God, make it your counsel, give yourself to the right, and live and die for God.